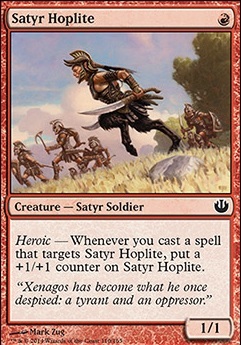 If I control multiple copies of satyr-hoplite and cast a spell on one do they all gain the plus off the first one? Heroic - Whenever you case a spell that targets Satyr Hoplite, put a +1/+1 counter on Satyr Hoplite. This is a surprisingly decent list- but the big thing for budget lists at FNM- SIDEBOARD. You don't have to grab staple sideboard tools- the more budget your list, the more powerful a transformative sideboard becomes. Changing from red devotion where you want Leyline of Sanctity asap to a Raid Bombardment/Mogg War Marshal tokens list is very powerful, and the flexibility of just saying 'oh, I'll run these 15 cards instead of (all my spells, all my creatures, half of each) is strong. It also lets you plan out sideboard tools so that some can sit mainboard- Ash Zealot and Harsh Mentor provide seven slots mainboard that can be smoothly swapped for more spells, more creatures, different hate depending on what you need, and planning that out can have immense benifits. There are lots of options- and finding cards that can flex into a second list with 15 swaps is suprisingly a lot simpler than it seems- just look for cards that are hit hard by spells your opponent will sideboard out so you can swap them in. eg; they ditch their high CMC answers/enchantment removal for more road blocks while you swap to a Goblin Assault/Curse of Stalked Prey list. Cards to look at - Satyr Hoplite Firebrand Archer, Five-Alarm Fire, Foundry Street Denizen, Fractured Loyalty, Markov Blademaster etc. Good luck, and happy brewing. Rancor Is always good with these types of decks. Satyr Hoplite with a Rancor stuck on it turn 2 is a 4/2 trample that can swing that turn. Assault Strobe is good, but this deck probably wants Temur Battle Rage instead. Since it's a casual deck, Rogue's Passage is always good to get your big guys past some pesky blockers. As budget removal that will also trigger heroic, you could use Prey Upon or Pounce, or even Savage Stomp if you want that +1/+1 counter. I think since you have The Crowd Goes Wild, you don't need Thrive. Travel Preparations is okay, but without the ability to flashback it, it's just not worth it. Ranger's Guile is a good budget option to protect your creatures at instant speed and trigger heroic. Hope any of this was helpful! Wow, Blood Moon in the board, how is this considered casual? Just joking, but Assault Strobe could be quite a lot of fun on a Satyr Hoplite after 2x Brute Force, you know, 20 damage? Titan's Strength could be a great addition to a deck like this to scry away lands you don't need while still pumping out damage by the fistful. Love this deck, thank you. I'm using it as a template for my first pauper deck. Maybe go with 16 Mountains and a 3 Forgotten Cave? The deck is so streamlined, it's not starved for mana at all. I'm putting in a few Built to Smash, seems to synergy nicely with the Immolating Souleater. And speaking of synergy, what do you think of adding Furor of the Bitten? It goes well with Satyr Hoplite making a 4/4 Turn 2. This is great. I'd probably swap Satyr Hoplite out for Seeker of the Way, actually. Lagonna-Band Trailblazer is great because of her 4 toughness -- she can't get bolted, even if you've just cast her. 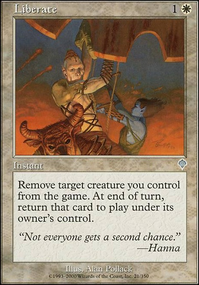 And the lifelink on Seeker of the Way is great for extending the game in your favor. Eight creatures seems kind of low. I'd add a playset of Satyr Hoplite for some more aggression. I'm thinking you could even cut green entirely and maximize on red and white for consistency; upgrading to a playset of Wojek Sirens seems awesome. You could upgrade to a playset of Mutagenic Growth, and maybe try out Brute Force and/or Rally the Righteous.